Catering by The Inventing Room brings an entertainment value to your guests' food experiences by creating magical & impossible treats right in front of their eyes. 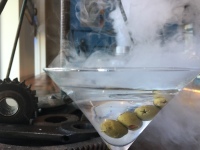 Using ingredients like liquid nitrogen & techniques like compression, we create culinary creations that amaze your imagination & tastebuds. produce events that are unforgettably unique. 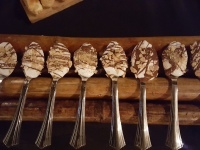 full catering for your entire event- food & drink entertainment stations with unique appetizers, dinner, desserts &/or fun liquid nitrogen cocktails customized for your special event; we love to personalize menus for each event adding unique touches & twists to old favorites. ​We can also work side by side with other catering companies or hotels to produce entertainment stations. After ten years of catering across the country & world - weddings, private intimate events, corporate events & special occasion events are our specialities; we want you to relax & let us take care of the details. A native of Colorado, Chef Ian Kleinman found his calling to cuisine at the young age of seven in his father’s restaurant in Breckenridge, Colorado. The critically acclaimed chef & member of the Art Institute of Colorado Hall of Fame and Johnson & Wales Hall of Fame; Chef Ian Kleinman’s love of food and the whimsical has led him to become a leader & visionary in the Molecular Gastronomy field and to five coveted invitations to showcase his skills at the James Beard House in New York. In 2009, Chef Ian created The Inventing Room, a catering company focused on food as entertainment which creates unthinkable & impossible dishes that dazzle your imagination & tastebuds. The Inventing Room was awarded the Achievement of Excellence by the American Culinary Federation, one of only three operations in the United States selected for this award in 2014. The Inventing Room is well known in the food industry locally and nationally for bringing their unique magic to premier events for the Coca-Cola Company in Atlanta, New York Academy of Science, Aspen Food & Wine Festival, and the 2015 International Food Festival in Dubai. 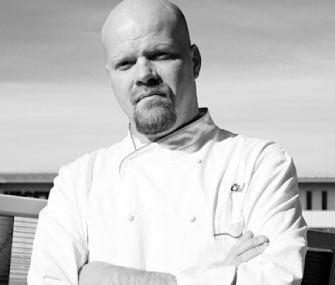 Chef Ian & his culinary team are proud to customize menus for each event and are honored to have been a part of countless special once-in-a-lifetime occasions- weddings, Mitzvahs, birthday parties, corporate events and private events across the Denver metro area, nation and internationally; we love the small personalized, intimate events just as much, if not more than the large events. After ten years, The Inventing Room's future is bright as we continue to expand our catering not just locally, but also abroad as we have recently opened our catering operation in Dubai as well. The success of our storefront dessert shop is tremendous and we have expanded to open dessert shops in Dubai and expect to open in Qatar by the end of the year. Stay tuned for updates!